We are so very proud and honored to share with you our 2018 National Caregiver of the Year award winner, Cherise Knowlin. 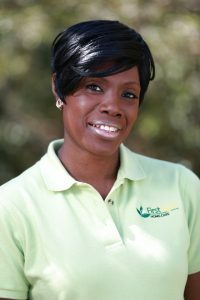 Cherise was selected from more than 4,500 caregivers and was the only FirstLight employee nationwide to receive the honor. The award was presented during an annual gala at the recent FirstLight Home Care national conference in San Antonio, Texas. Cherise Knowlin, FirstLight Home Care of The Grand Strand, is our 2018 Caregiver of the Year. Our caregivers are the heart and soul of our company. They breathe life into our Culture of Care and build meaningful relationships that provide help, joy and peace of mind to families across the nation. Caregiver of the Year nominees were evaluated based on a variety of criteria, including service excellence; quality of caregiving skills; and empathy, respect and compassion toward clients. Knowlin was nominated for the award by FirstLight Home Care of The Grand Strand General Manager Jamie Recupero, and owner Kristin Randall. FirstLight caregivers like Knowlin help seniors and other adults with many needs – from personal hygiene and household duties such as cooking, cleaning and running errands, to respite and dementia care. Our finalists this year included Gladys Villa, Mount Kisco, Westchester, NY, and Denita Roberts, Tomball, TX. See why Cherise is so deserving of this award in our 2018 Caregiver of the Year video. You can view additional videos featuring previous Caregiver of the Year award winners to learn more about our extraordinary people and what it means to be a FirstLight caregiver.